How many Maintenance Chemicals Do you need? I recently read an article in Family RVing (May 2018, Page 40) that listed a number of Specialty Products for RVs. I looked at the list and thought: Wow that is a lot! After reading the article I realized that there were a number that were single purpose products that could be replaced with a multi purpose product. In many RV problem situations, there is a tendency to treat the symptom, rather that deal with the underlying issue. These Eight products can be reduced to Three which deal with the root cause rather than dealing with the symptoms. 1. We’ll go with WD-40 which, while it is a lubricant, is used in industrial applications as a metal degreaser and short-term lubricant. 2. Then I’d add Premium or Heavy-Duty Silicone which effectively replaces JB-80. In addition it can be safely used on any area that a non-petroleum based lubricant should be used. It is 6.6% silicone rather than the typical Walmart, Auto Parts, Canadian Tire products that are 2.0 to 2.5% silicone. This provides a long lasting, durable lubricant that is safe on plastic, metals and areas where a petroleum-based lubricant would harm rubber. (Sewage dump valves as an example). 3. For the remainder of the other chemicals listed above, go with Corrosion Block® which stops corrosion at the molecular level. The corrosion can be between dissimilar metals on electrical contacts on batteries, electrical connections on circuit bulbs, light sockets and the like. It also deals with the corrosion that occurs in door locks (where up to five types of metals are often present). Corrosion Block® will wick up into a connection if applied to the junction between two parts of a connection. This means that functioning connections can be protected without removing the two halves, reducing the risk of damaging one of the parts. c. Protect-All Slide-Out Dry Lube for the popular POWERGEAR / Lippert gear type slideout tracks. It is also excellent as a dry lubricant for drawer type steps that slide on ball bearing equipped "drawer track” style assemblies. Because it is a dry lubricant and heavy-duty rust inhibitor; dust, sand and the like does not stick to it. 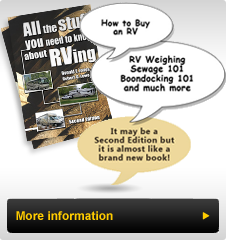 In today’s trend to downsize, RVers need to consider what they take with them, especially when it comes to RV maintenance products. The ‘I’ll fix it when I get home’ approach does not always work. Having the proper lubricant and protectants ready when the need arises is the best approach. Have a look at the following: TechTips (#46 and 52), together with our Blog. I hope you find this Blog Article helpful and I know that with these products, properly applied where and where needed you will enjoy many years of trouble free RVing.